One of the main Australia tourist attractions is of course the Australian Outback itself. This page gives you an overview of the major tourist attractions of the Australian Outback. To find out more just follow the links. Most of the top tourist attractions in the Australian Outback can be reached from the Stuart Highway, the famous road that dissects Australia from south to north. The highway takes you from Adelaide in the south to Darwin in the north. Alice Springs, the so called Outback capital, sits astride the highway, nearly exactly half way: 1690 km from Adelaide, and 1525 km from Darwin. If you want to discover the Australian Outback and have little time then Alice Springs is the place to start. Many Outback Australia tourist attractions you have heard of are close to Alice Springs. I personally consider the Alice Springs Desert Park a top Australian tourist attraction in its own right. If you want to take more away from your Outback trip than your Uluru sunset shot and souvenir T-shirt, then you should visit the Desert Park before you visit anything else. Kata Tjuta - The Olgas are part of the same national park (the Uluru Kata Tjuta National Park) and are 50 km from Uluru. Definitely make time for them! 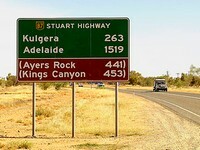 The third big tourist attraction in the Alice Springs area is Kings Canyon. This is a different national park (Watarrka National Park), and is 300 km from Uluru. Those are "the big three", the top Australian tourist attractions in this area, but there is a lot more to see. Also easy to get to are the West MacDonnell Ranges, and you can find many more famous attractions there. The East MacDonnell Ranges are not as well known, but just as beautiful. Then there is Palm Valley, Hermannsburg, Chambers Pillar... I love the Alice Springs area, and it's easy to spend weeks there exploring all the attractions. For more info look at the page about tourist attractions in Alice Springs. It is a loooong drive from Alice Springs to Darwin. I find the drive itself attractive: the endless horizon, the sense of space and freedom, the everchanging landscape, the slow change from red desert interior to lush, green tropics... But not everybody agrees. It is a long drive, and there is not much on the way in terms of tourist attractions. The Devils Marbles can be found 393 km north of Alice Springs (or about 100 km south of Tennant Creek). The next major tourist attraction, about 660 km further on, are the hot springs at Mataranka, and from there it's only 105 km to Katherine and one of my favourite attractions in Australia: Katherine Gorge. Darwin is my favourite city in Australia. It's also one of the main tourist attractions in Australia, not least because of the national parks just outside Darwin. Kakadu National Park and Litchfield National Park are the top north Australian tourist attractions. In South Australia, half way between Adelaide and Alice Springs, and also right on the Stuart Highway, is the opal mining town of Coober Pedy. It seems to be a love it or hate it place... It sure is different! Well, and then there is the remote north west... It has been dubbed the Outback of the Australian Outback, and it certainly is adventure territory: the Kimberley region. This is where I live. It's an area where tourism has been growing in leaps and bounds, and it's not hard to see why. If you'd like to know more about the Western Australian tourist attractions in the Kimberley check out my other website: the Kimberley Travel Guide. is a great introduction to travel in the region. shows you how to make the most of your adventure in Australia's tropical north.